조선시대 백자 항아리로 높이 41.3㎝, 입지름 19㎝, 밑지름 21.5㎝의 크기이다. 아가리 가장자리가 밖으로 말렸고, 목 부위의 경사면부터 풍만하게 벌어졌다가 서서히 좁아진 둥근 몸체의 항아리이다. 농담(濃淡)이 들어간 검은 안료로 목과 어깨 부분에 구름무늬와 꽃잎무늬를 돌렸고 아랫부분에는 연속된 파도무늬를 장식했다. 몸체의 한 면에는 대나무를, 다른 한 면에는 매화등걸을 각각 그려 넣었다. 유약은 푸르름이 감도는 유백색으로, 전면에 고르게 씌워져 은은한 광택이 난다. 이러한 항아리의 형태는 16세기 분청사기에서 보이며, 특히 중국 명대의 항아리와 비슷하다. 어깨 부분과 아랫부분에 표현된 무늬는 17세기 전반기의 무늬로 계속 이어진다. 매화, 대나무의 모양이나 밝은 유약색으로 보아 16세기 후반경 경기도 광주군 일대의 관음리 가마에서 만들어진 것으로 추정된다. 매화와 대나무 그림은 솜씨가 뛰어나서 궁중화가가 그린 것으로 보인다. 이 항아리는 철화백자 항아리로서는 초기의 것으로, 당당하고 풍만한 모양새에, 능숙한 솜씨로 매화와 대나무를 표현하여 문양과 형태가 잘 어울리는 우수한 작품이다. This white porcelain jar of the Joseon Dynasty has a height of 41.3cm and bottom width of 19cm. This jar has a round body with an everted mouth rim. The body fully widens from the slant of the neck and then steadily narrows at the bottom. The cloud and flower patterns on the neck and shoulder parts of the jar were painted with black pigment that has shading, and so were the continuous wave patterns on the lower part. A bamboo tree is painted on one side and stumps of plum flowers are painted on the other side of the body. There is dim shine on the jar, which was evenly coated with bluish powder-white glaze. 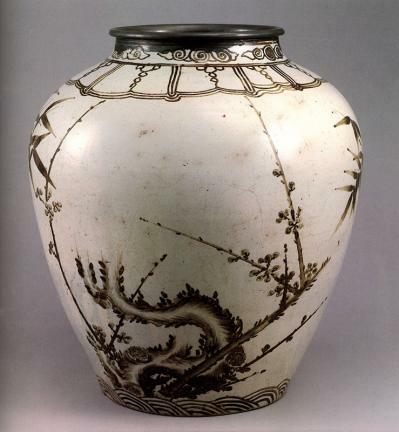 This kind of jar can be found among buncheong ware with white slip and grayish-green glaze, from the 16th century. Especially, it is very similar to the jars of the Ming Dynasty. The patterns on the shoulder and lower part are continuously used on the jars in the early 17th century. Considering the light color of the glaze and the images of plum and bamboo, it is estimated to have been made at the kiln in Gwaneum-ri, Gwangju-gun, Gyeonggi-do, South Korea. 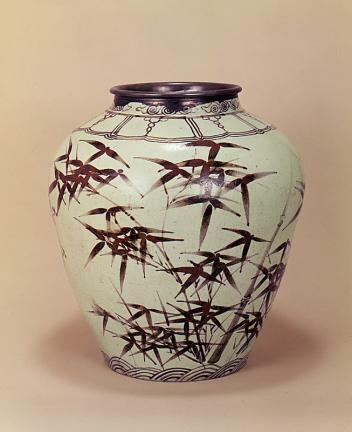 It is believed that a palace artist drew the exceptionally excellent bamboo and plum paintings on the jar. The jar belongs to the early period of white porcelain with underglaze iron design. It is an excellent example, boasting harmony in the shape and patterns of the jar. It has an imposing and splendid body shape with excellent paintings of plum and bamboo on it.